The Land Rover Ben Ainslie Racing Team is going for a never-accomplished double in world class sailing in 2016-2017: 1. Win the 2017 America’s Cup for Great Britain (that’s right, the UK has never won it), and, 2. Do so while being the most sustainable sailing operation ever. Sir Ben Ainslie, skipper of the team, winner of the 2013 America’s Cup while sailing for the US’ Team Oracle, and the most decorated Olympic sailor ever, is taking the lead regarding the first goal. And it is his vision that is animating the second. 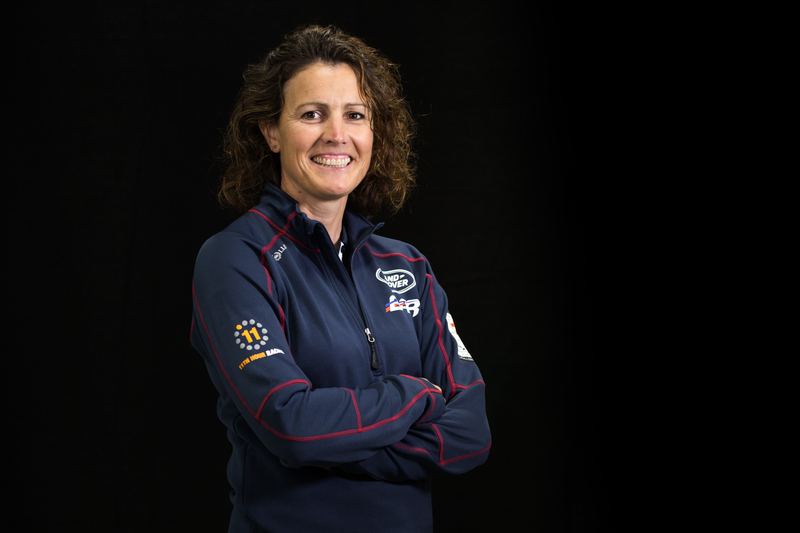 GreenSportsBlog spoke with Susie Tomson, Land Rover BAR’s Sustainability Director, about surmounting the high sustainability bar Ainslie has set for the team. GreenSportsBlog: Before we get into the Land Rover BAR’s sustainability story–which is, to the uninitiated like yours truly, quite amazing, I’d like to get a little bit of your background. What roads led you to become the team’s Sustainability Director? Susie Tomson: Well, for starters, I had an environmental work background. In particular that meant using data and information to help organizations make smarter environmental decisions. I always loved sport and got sustainability work with the Royal Yachting Association, the London 2012 Olympics and the Ryder Cup. I then met Sir Ben Ainslie while in the states about 2 years ago just as he was coming off winning the 2013 America’s Cup and was starting his own team and I was on the team a few months after that. GSB: So did you bring the sustainability vision to the team or did Ainslie already have green as part of the team’s core? ST: Oh, Ben definitely had the vision when I joined. You’ve got to realize, the team started around 18 months ago but sustainability was involved from the planning stages months earlier. GSB: Where did Ainslie’s vision come from? I mean, I don’t automatically associate sailing with concern for climate change and the environment. ST: Well, everything Ben does is big. He won the 2013 America’s Cup for Oracle, leading one of the greatest comebacks of all time. He’s the most decorated Olympic sailor ever. His sustainability vision is equally big: And that is to ensure we have a healthy, clean ocean environment. There is no other option. And he, through his position in the sailing world, aims to bring along other teams on sustainability. GSB: That’s likely why he enlisted as a spokesperson for 100% Sport (#Go100Percent), the movement led by athletes and sports teams, to get people to switch their electricity supply for their homes and businesses from dirty power to 100% clean power. GSB: So tell me, what are your chief responsibilities? ST: Taking a big picture view, we need to do in sailing what the world needs to as it relates to climate change. The world, especially as we grow from 7 billion people to 9 billion by 2050, needs consume resources with much greater efficiency. The same holds true with sailing: Maximum performance whilst using a minimum of resources. GSB: So what does that mean for Land Rover BAR? ST: It informs everything we’ve done and everything we do. Starting 18 months ago, we had to build the team’s base complex in Portsmouth. We built it to a high BREEAM standard, with BREEAM being the UK equivalent of LEED certification. We have on-site solar which supplies the base with 20% of its electricity. Use LED lights. Water use at the base is optimized. The Visitors Centre, which is being built, will also be to BREEAM standards. GSB: That’s terrific. What about measuring your environmental impacts? ST: We take measurement seriously and have a strong Sustainability Management system in place, with the help of our Sustainability Sponsor, 11th Hour Racing. We follow the ISO 20121 standards for sustainable events. We fill out BSI (British Standards Institution) audits twice a year–the Royal Yachting Association helps us in this regard. We also report quarterly on our sustainability efforts to 11th Hour Racing. We file to GRI 4.0. And we put out an annual Sustainability Report. GSB: WOW! You aren’t kidding when you say you take sustainability measurement seriously! ST: Yes. We also use Life Cycle Assessment to measure the efficiency of our use of resources in the building of our race boats as well as the support boats. GSB: What is Life Cycle Assessment (LCA)? ST: It’s a detailed look at every process, every input, from a carbon point of view, involved in the building of the boat, from concept to design to manufacturing to transportation to end of life. This is really a first in the sailing world. GSB: Can you give us a for-instance as to how LCA has helped the team be more carbon efficient? GSB: Virtual Support Boat? Luddite that I am, I have to ask–what’s THAT?!?! GSB: …Mission control of sorts. ST: Yes. This has significant carbon reduction benefits as well as time-saving benefits–we keep the designers on land, off the water. GSB: Did Land Rover BAR pioneer Virtual Support Boats? ST: Formula 1 teams did it in auto racing but we’re the first in sailing to use this approach. GSB: This raises an interesting moral question. On the one hand, the ethos of the team would be to share this technology with its competitors, which would lower the carbon footprint of all teams. On the other, Land Rover BAR has a competitive advantage right now. Is Ainslie willing to give that up? ST: Absolutely, we want the other teams to follow suit on this and other aspects of sustainability. GSB: Like LCA and the use of recycled carbon fiber? ST: Certainly. We really want to influence not only sailing racing teams but the entire marine and composite industries. GSB: What other sustainability “next steps” does the team have planned? ST: …Ben Ainslie was the first athlete to #Go100Percent and BT is getting that message out. We also send a monthly sustainability message to 15,000+ fans in the UK. GSB: Inspiring fans to positive environmental behavior change is a huge mantra of GreenSportsBlog. ST: It is with Land Rover BAR as well. We live it every day. Thanks Bink! I learned a lot from Dr. Tomson and what she’s doing w/ Land Rover BAR. Stay tuned to GSB; there will be more on this story in the coming months.